Need some success at speaking? Designed for the GCSE specifications for AQA, Edexcel and WJEC Eduqas, our packs will help your students to prepare for their speaking exam. Covering all three themes, the pack also provides differentiated material for Foundation and Higher tiers, teaching notes and answers. 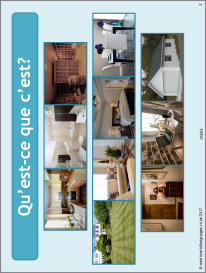 This PowerPoint introduces ten rooms of the house, with a matching task, memory game and translation questions. Very useful as an introductory activity. Thanks!